Instead of having quarterback Josh Rosen represent the UCLA offense at Pac-12 Media Days, head coach Jim Mora brought center Scott Quessenberry. The choice was not popular among media members, but it was fitting for a team with an offensive line facing heavy scrutiny. Mora said Wednesday his biggest worry heading into the 2017 season was health and depth on the offensive line. “I know most of the questions will most certainly be about our quarterback, who’s coming off an injury, but we need to be able to stay healthy on the offensive line and develop depth at that position,” the head coach said. Pac-12 notebook: Could the Pac-12 Championship Game come to the Rams’ new stadium? Linebacker Kenny Young meets with the media at Pac-12 Media Days to talk about the progression of UCLA’s defense, the rivalry between USC and how he has learned to take care of his body. 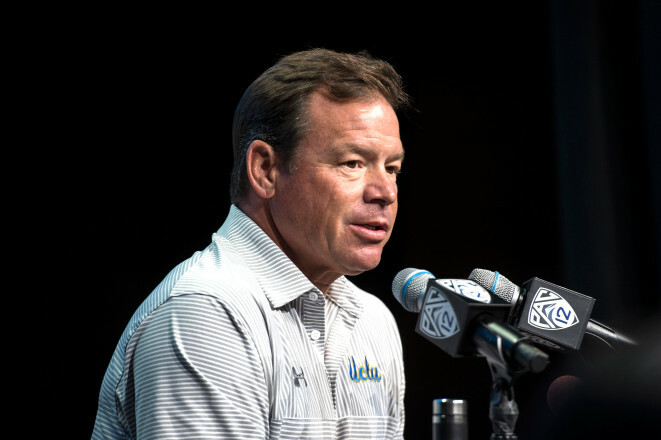 Here is 12 minutes of Jim Mora‘s press conference at Pac-12 Media Days on Wednesday. The head coach talks about the transfer of Sunny Odogwu, the elimination of two-a-days and the battle of Josh Rosen and Sam Darnold in L.A. Follow along during Pac-12 Media Days as representatives from all 12 football teams meet with the media before football season. UCLA will take the main stage at Hollywood and Highland at 10:30 a.m. on Wednesday. UCLA was picked to finished third in the Pac-12 South in the preseason media poll released Wednesday before the conference’s two-day media event in Hollywood and Highland. The Bruins (4-8, 2-7 Pac-12 last year) finished fifth in the division in 2016. 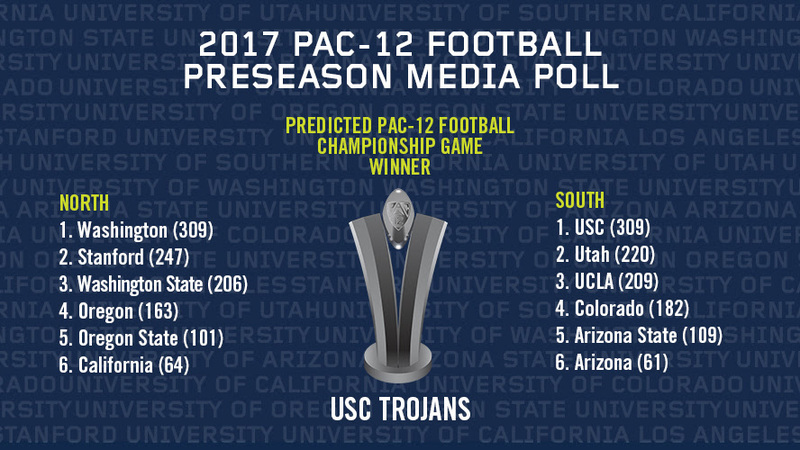 After USC picked up 49 first-place votes in the division, Utah, UCLA and Colorado all received one vote to win the Pac-12 South. The 52 media members who voted in the poll tabbed USC as the favorite to win the conference. USC and Washington both received 49 first-place votes to win their divisions and the Trojans grabbed 28 votes to win the conference championship to UW’s 22.